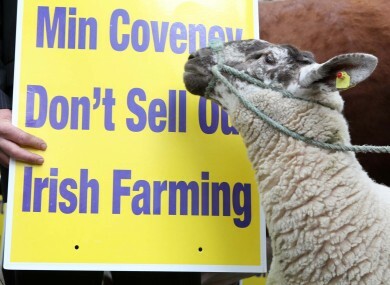 The opponents to CAP reform are many and varied in Ireland. Well, good afternoon Joan Burton. The Minister for Social Protection is taking written questions from 2pm today. She’s followed by Leaders’ Questions at 3.15pm and then questions to Taoiseach Enda Kenny at 3.36pm. It’s a long evening in the Dáil today, after its late start with Fianna Fáil coming back at 7.30pm to bring up a motion regarding people in mortgage debt. They are calling for a revision on the Code of Conduct on Mortgage Arrears, looking for clarity on what is an “unsustainable mortgage”, a reinstatement of the number of times a bank is allowed to contact a mortgage holder every month and a reinstatement on the 12-month moratorium on repossession process when a mortgage holder has entered the Mortgage Arrears Resolution Process. Much of the motion focuses on how mortgage holders are treated by their financial institutions when they (the mortgage holders, that is) get into debt. It’s actually worth a read – click here. By 9pm we’ll have an hour to listen to statements about offsore oil and gas exploration. At 10pm, they shut up shop for the night. Order of business opens at 2.30pm with a straightforward (ie, no debate) motion on an amendment to the Electricity Regulation Act 1999. The second stage of the Land and Conveyancing Law Reform Bill 2013 will be of note at 3.45pm as Justice Minister Alan Shatter makes an appearance in the chamber. That bill is expected to sort out a loophole by which hundreds of repossession cases had been adjourned – it isn’t retrospective but it does in future give courts the ability to adjourn a family home repossession case so the householder can apply for personal insolvency. After that is discussed, four senators may take the floor for four minutes each and speak on whatever their heart desires. Email “Oireachtas agenda: Motion for mortgage holders and CAP, oh CAP”. Feedback on “Oireachtas agenda: Motion for mortgage holders and CAP, oh CAP”.